Times have been good in the purpose-built rental apartment industry. Our industry has outperformed every other sector in the real estate industry in the past six years. Demand for new apartments is high, and demographic change taking place now is increasing that demand. 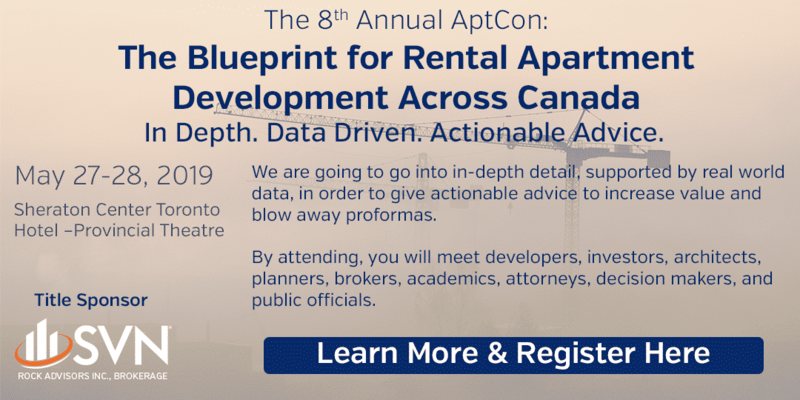 And yet purpose-built rental apartments have been overshadowed by the heated activity within the condominium market in such urban centres as Toronto and Vancouver. Condominium developers haven’t shown much interest, yet, in becoming merchant builders of purpose-built rental apartments, but this is going to change. A merchant builder differs from a conventional builder in that a conventional builder finances a development, builds it up, and owns it afterward. Conventional builders receive all of the profit of a development, but also assume all of the risk. Many apartment builders are conventional builders, as they’re in the game for the long-term income. Merchant builders are in the game to build and sell. They partner with financiers and they arrange to sell off a building once it is built. Condominiums have been an excellent venue for merchant builders, but merchant condo developers can find success as merchant apartment builders. The incentive to do so is increasing as condominium prices cool off. We know condo developers know how to build new buildings. We know that they are skilled in buying and entitling land. We also know that the units they build are popular with renters, since piecemeal condo-unit rentals helped increase the rental market in major centres like Toronto and Vancouver. If condominium developers are to become merchant apartment builders, the challenge is that they will have to take their buildings and turn them over to a professional property management firm who can market the units, rent them out and manage them. They have to be willing to wait until a new building is leased up, so it can be valued and sold to one of the many apartment investors who would be interested in buying a newly constructed building. But as the condominium market cools, condo developers will find a solid market waiting for them in the apartment industry. There is still a lot of catching up to do returning the supply that was severely limited through rent controls and regulations in the 1970s. Now that those restrictions have eased, we have pent-up demand that far exceeds supply. Vacancy rates remain extremely low in most centers across the country and rents are increasing. Supply constraints in the last two decades of the twentieth century means that any and all new construction automatically enters at the top of the market. A lease-up is virtually assured, thanks to how much demand exceeds supply. Building rental apartment buildings gives condominium developers a new marketplace of buyers eager to snap up properties. Some are even willing to buy a vacant apartment building and do the leasing themselves (this is referred to as a pre-sale or a forward sale). CMHC financing is available to build apartments at very attractive interest rates. And let’s not forget purpose-built student housing. This niche market has seen explosive growth in the past few years, providing higher returns per square foot than conventional rentals. Student housing is bolstered rather than harmed by recession. When times get tough, people go back to school, increasing demand for student housing, as well as opportunities for developers. Any developer looking into building a rental apartment building still needs to undertake a feasibility study. An unbiased report conducted by qualified and experienced researchers will help developers decide whether or not to build, what to build, how much rent can be charged on each unit, and how deep the market is. For years I’ve said that the time to build apartments is now. As the condominium market resets to more realistic levels, the incentives to build new apartments is going to increase. The next decade will see a boom of new rental apartment construction. Prev:Housing Market Steadies; Impact for Apartment Developers?